The IACIS WFE Training Program is a 36-hour course of instruction, offered over five (5) consecutive days. The program is designed to provide students with a detailed study of the Windows Operating System. Through a variety of lectures, instructor-led and independent hands-on practical exercises students will study the Windows operating system in far greater detail, and with far more specificity regarding critical areas of forensic focus, than what can be accomplished in the more generalized, overview perspective of the BCFE Training Program. In short, this program will focus on how a variety of Windows Operating Systems work “under the hood”, with a focus on the most current/common versions. At the conclusion of this course, students will have a clearer understanding of various operating system artifacts and why they present as they do, and how knowledge of these artifacts can play a significant role in the forensic and investigative process. The WFE Training Program champions a forensic tool-independent approach to learning. This approach allows for a deeper exploration of the underlying subject matter than might be afforded in other programs which are designed to complete a particular task or view/extract a particular artifact. The WFE Training Program is designed to build on and expand the students existing forensic knowledge and skillset and is not an entry level class. Prospective students should reference the “Prerequisites” section elsewhere in this document for additional information about expectations for students. The WFE Training Program will assist students in preparing for their CAWFE certification, however the training program is not taught to the certification, instead, students are recommended to take notes, participate, and make the most of the classroom environment. The material provided to students will be used as part of certification process, however, reading outside of the provided material is advisable and will benefit the student in obtaining a deeper understanding. As an example, the WFE material includes information about Artifact A, but the trainers focus on Artifacts B, C and D. The certification may include questions on Artifacts A and D.
Virtualisation: Concepts, artefacts and practical usage. We explore the various terminology used to describe virtualisation and its associated technologies. In this topic, we work through a command line approach to virtualise a suspect forensic image and discuss how to bypass user logon passwords. Partitioning schemes: Understanding MBR and GPT partitioning schemes. We explore these common schemes and parse some of the structures at the hex level. Understanding some of these structures enables the examiner in linking devices to Windows artifacts. File Systems: Overview of the common file-systems with a focus on NTFS and its critical use of metadata files and understanding of their structures. Security Features and Encryption common to the Windows Operating System. Artifacts & More: We will review the concepts, identification and analysis of many Windows artefacts, such as how to determine application usage, user interactions, event logs, volume shadow copies etc. We also cover some of Microsoft Windows defaults in order to assist an examiner in determining user knowledge when things change from the norm. RAM and virtual memory management concepts. We use command line tools to analyse a RAM image and determine application usage and user interaction. 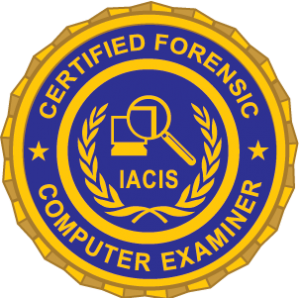 PREREQUISITE: Basic Computer Forensic Examiner [BCFE] course AND completion of the Certified Forensic Computer Examiner [CFCE] certification are highly recommended, but not required. CERTIFICATION: Attendance at WFE entitles each member to one attempt at the CAWFE Certification process. The attempt must be completed within the calendar year of attendance at WFE. Further details as to the timeline for certification will be provided upon completion of WFEand upon beginning the CAWFE. Existing IACIS members simply log in with your credentials and go to the products page to purchase and register for the course. For non-IACIS members, the membership fee is waived with the purchase of the training course; however, to register for the course you must complete a membership application at the time of purchase. Cancellation of this class may occur if there are insufficient students registered. In the event of a cancellation, personnel will typically be notified by email within 48 hours of the registration closure date. IACIS is not responsible for any individual expenses incurred as a result of a cancellation. The limit of IACIS financial liability is a full refund of the course fee. * Please make arrangements to arrive in time to check-in so that you may be in class promptly the first day. Classes begin at 8:00 AM ET and conclude at 5:00 PM ET, each day, with a one hour lunch break. Classes will end at 4:00 PM ET on the last day of class. Please do not arrange for departing flights prior to 7:00 PM ET to allow time for travel to the airport and any security clearances. The dress code for the conference is business casual (collared shirts and slacks).The wearing of shorts, flip flops, tank tops, etc. is not allowed in the classroom. Personal computers are not permitted in the classroom. Students are required to attend all classes to successfully complete the program. Students who fail to meet the attendance requirements will not be issued a certificate at the conclusion of the program. The 2019 course will be taught at the Caribe Royale Hotel, 8101 World Center Drive, Orlando, Florida 32821 (USA). This hotel has much more conference space than our previous hotel. Additionally, it’s closer to the Orlando International Airport, has a much larger pool, spacious workout facility and is very close to Disney World and Universal Studios.